This Economy Saver premium 1-1/4" width diamond-coated blade is great for flush-cutting away tile grout, mortar or thin-sets. Great for making controlled plunge cuts, this blade will cleanly make slots, grooves or channels into concrete type surfaces. The flush-cut design (blade step-down) allows this cutter to notch out tiles or other materials flush with your desired finished surfaces all the way into the corners. 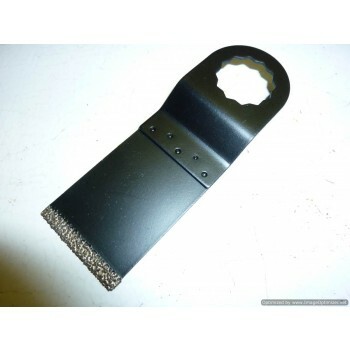 Choose this diamond blade for tile gaps from .085" and up. This 1-11/16" plunge diamond blade is the deepest available in a 1-1/4" width design. A must have item in your tool box. Our S064 Flush Cut 1-1/4 inch wide Diamond Blade is great for controlled plunge cut situations. Cut into surfaces such as grout, Hardie Board, concrete board and minor cut-outs into ceramic tile.